Before she became the box-office smashing Captain Marvel, the multitalented Oscar-winning actor Brie Larson made her directorial debut with “Unicorn Store,” which premiered at the 2017 Toronto International Film Festival. Now available to worldwide audiences through Netflix, Larson’s first artistic venture behind the camera (in which she also stars) sadly is a puzzling cinematic effort that struggles to strike a coherent tone. Quirky to an extreme with not much to say about the millennial resistance to maturity and grown-up responsibilities, Larson’s film feels like a perplexing stylistic disagreement between its creative parts. Larson herself plays one such twenty-something fantasist. She is the wide-eyed woman-child Kit with a severe Peter Pan complex and a lifelong obsession with, wait for it, unicorns. After dropping out of art school (or possibly getting kicked out of, and it’s not hard to understand why after the childish tableau of rainbows she paints in the opening scene), Kit moves in with her annoyingly oddball parents (played by Joan Cusack and Bradley Whitford) who don’t seem to do much to challenge her disillusions about adulthood. Still, a mild dose of nagging goes a long way and Kit all-too-conveniently lands a mindless temp job at an advertising firm, tasked with monotonous admin duties like making copies. While trying to keep her head above water in her newfound dead-end setting, she receives a promising invitation from a mysterious salesman (a loud Samuel L. Jackson, looking both like a well-meaning enabler and superhero villain). If Kit manages to prove her worth to The Salesman who overseas a Unicorn store (which could be straight out of “Mr. Magorium's Wonder Emporium”), she would get the golden ticket in due course and receive her lifelong dream: a real unicorn of her own. What she has to do exactly to prove her merit isn’t entirely obvious; but then again, every single plotline and personality in this film feels like a hazy sketch. So when Mamoudou Athie (“The Front Runner,” “Patti Cake$”) enters the picture as Virgil, pretty much the only character free of fake eccentricities, he briefly resuscitates “Unicorn Store” with some much-needed oxygen. Somehow admiring Kit’s immature frankness, Virgil helps her build a stable in secret without questioning its purpose. Meanwhile back in the advertising firm, Kit seizes an unexpected opportunity to climb up the corporate ladder through a presentation she promises to deliver to her creepy and borderline inappropriate boss (Hamish Linklater). 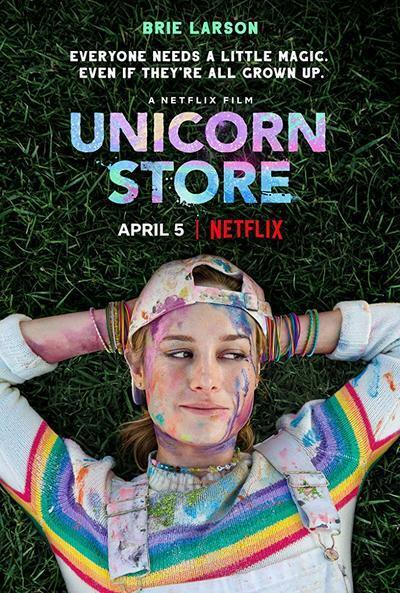 Written by Samantha McIntyre, “Unicorn Store” suffers from a visual and thematic uncertainty throughout. The romance between Kit and Virgil never quite materializes in earnest—and trust me, a little adultness would have gone a long way. Even more frustratingly, the subtle sexual harassment storyline that involves Kit’s icky supervisor receives a gentle, comedic treatment that predictably doesn’t result in any laughs. In achieving a dreamlike, dust-pink look, Mirren Gordon-Crozier’s rich costume design does much of the heavy lifting—both Larson and Jackson wear an array of colorful ensembles that compensate for the thinness of their respective characters. While “Unicorn Store” resolves to Kit’s self-realization eventually—we do briefly get to see her grow up and make mature choices—it still leaves a baffling aftertaste for a film that overestimates its own charms. Perhaps not every inner child needs to be unleashed.